We all like the comfort of a well-protected smartphone or laptop. Nintendo Switch consoles often receive the same rough treatment on the road. Enter dbrand - a slim vinyl skin that both protects and cutsomizes your console. We've tried it out. If you’re anything remotely similar me, you like to take care of your gadgets, especially those grinding against the keys in your pocket. Scratches and cracks are a nightmare, but those clunky covers can also seem like an unwelcome visit by an oversized Freddie Krueger at times. 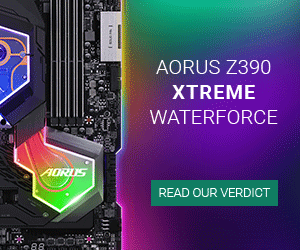 Thankfully, there are slimmer alternatives to protecting your pocket sized electronic marvels, not only shielding them from the cruel realities of the outside world, but also simultaneously giving them a bit of dandy pizzazz. I have long wanted to write about dbrand, a Canadian manufacturer of slim vinyl covers for a long range of smartphones, laptops, PlayStations, and handhelds, like Nintendo Switch. 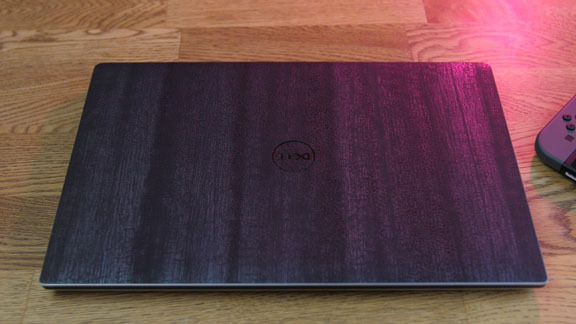 dbrand has been a trusted armor for my Galaxy smartphone for well over a year, and I have fitted it onto my Dell XPS laptop, both without any issues. 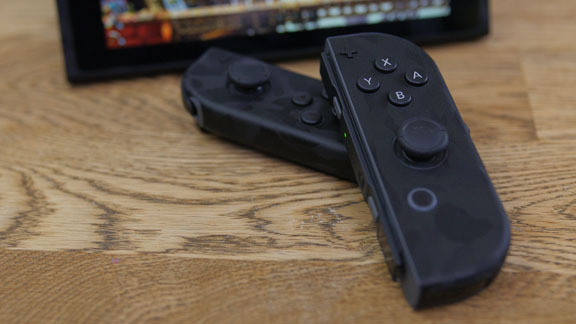 My Nintendo Switch is a perfect opportunity to give dbrand one more challenge. I am a frequent Switcher, or what you might call it. I am often on the road between shows, events, and conferences to keep you, dear readers, well fed with the latest news and views on tech. And Nintendo Switch is among my favorite companions. First advantage is total vanity. My Switch console is absolutely guaranteed to stand out. You can choose between a full rainbow of colors and textures, but my Nordic tradition compels me to go black, and I have chosen a Camo texture. Just because it’s cool. When choosing designs, you don’t have a free pass to put your grandmother on display, you are constrained to the predefined colors and textures. You can, however, combine them as you want. The Nintendo Switch palette covers (pun intended) 12 designs that you can combine freely on left and right Joy-Con, the dock face, dock accents, and finally the console itself. Be a patriot and go Red, White and Blue, or be Portuguese and go Red and Green. 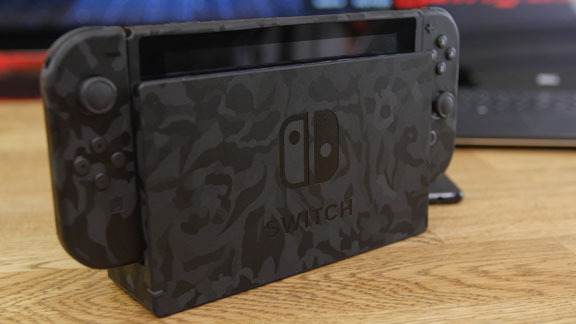 Or do like me: Become a martial ninja of the underground and paint your Nintendo Switch black camo. I am especially fond of the skins that provide a bit of texture. It creates a fantastic look, and at the same time it provides a solid grip. This is especially relevant for your smartphone – and your Switch. 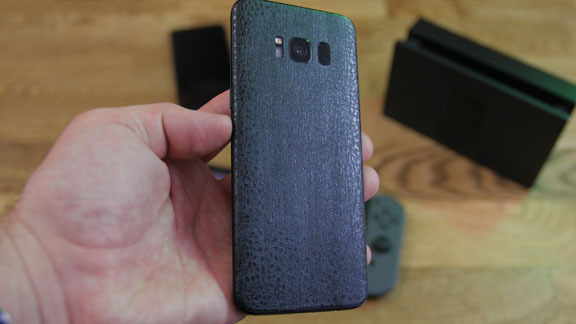 Popular phone covers have more textures, like matrix, camo, carbon fiber, dragon, stone, matte, metal, leather, and wood, where the Switch selection is more limited: matrix, camo, carbon fiber, matte, and gloss. The only thing you need to apply the skin, besides the device and the dbrand skin itselt, is a hairdryer. Or bring over your friend Brad. Anything good at blowing hot air will do. dbrand have been kind enough to provide the public with video guides for all their skins, much like an audiovisual IKEA experience. Having a bit of dexterity is a clear advantage, and if you’ve got that bit of DIY spirit in you the step-by-step guide should be quite easy to follow. Applying the skin takes around 45 minutes – which is not too bad, especially considering that you have five individual parts. As you can see on the pictures it fits perfectly and looks stunning! I’m a happy customer for now. Protection-wise, you cannot start using your gadgets as throwing projectiles just yet. The skin is not made of adamantium, and your device will break. Even if you try to bounce it on the sidewalk. As mentioned, however, at the top, you will be well guarded against scratches and wear from countless hours spent in your pockets or bags. dbrand offer free shipping for every order above $30. A full Nintendo Switch makeover costs $34.75, so you’re safe. Shipping takes 2-5 business days for US customers, Europeans must wait a little longer, but usually only a week. In short, if you'd like to protect your smartphone, Nintendo Switch, console, or laptop from scratches and bruises, dbrand skins are a stylish option. 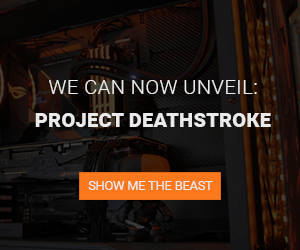 Also for just giving them a new personalized look. If you're that kind of person that tosses your devices around like a baseball pitcher, the dbrand skins will probably not give you much protection. But if nothing more, you can at least use them to cover the superficial injuries.